Successfully Added Aluminum Case Holder with Bluetooth Keyboard for iPad to your Shopping Cart. This stylish iPad aluminum case comes with a built-in QWERTY Bluetooth keyboard that seamlessly connects with the iPad for quicker and more comfortable typing. This iPad case holder can easily convert into a laptop style position for a more comfortable typing, as well as for tablet use by folding its new hinge, which then hides the Bluetooth keyboard out of sight. This iPad aluminum case provides 2 viewing angles in both portrait and landscape modes while assuring full protection for the iPad screen. It also allows access to all the controls and ports at all times, meaning you have full functionality whilst your iPad is still inside the case. This perfect innovative and durable iPad aluminum case is ideal for people who regularly use their iPad in any environment for e-mailing, making notes, and writing documents; whilst its clever design and metal cover make sure your iPad is always safe and secure, whatever the surface supporting the iPad. This stunning iPad case is made with incredible attention to detail, ensuring that it is of the very highest quality. This amazing new Apple accessory is perfect for reselling on your eBay listing page or drop ship website. Click "Add to Cart" now, and Chinavasion - your reliable source of electronic devices and accessories - will express ship you a sample straight away. Durable and strong, keep your iPad secure. Do more with your iPad, while keeping it in mint condition. The aluminum case allows for tablet usage as well. 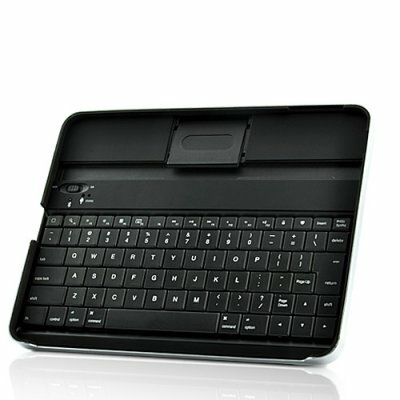 Does this Bluetooth keyboard case fit for iPad 2? It has been especially designed for iPad 1 but also fits for iPad 2. However not perfectly so we can't guarantee your iPad 2 will totally match with this Bluetooth keyboard case.